The Arab uprisings of the last several months, which have swept through Egypt, Tunisia, Libya, and several other countries through the Middle East, have posed a tremendous challenge to anyone trying to get a grasp of what’s going on or anyone actually trying to tell the story. How do you link literally hundreds of events, scattered across over a dozen countries, all of which have related to each other, but each of which deals with completely separate political realities? Here’s the best attempt we’ve seen yet, courtesy of the data-viz wizards at The Guardian. 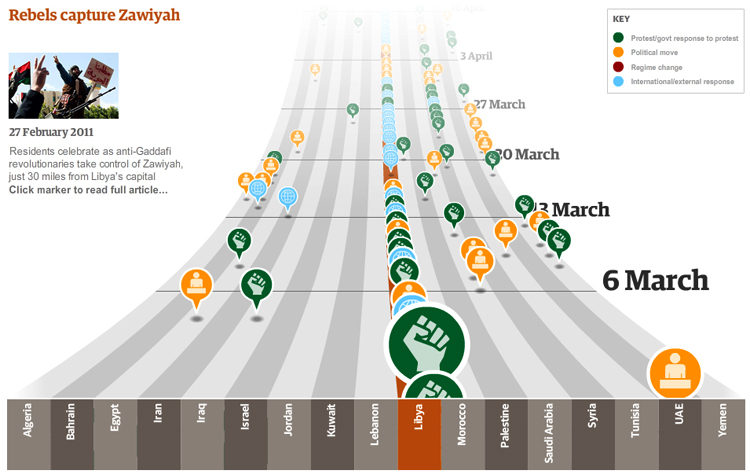 Arab Spring, an interactive timeline, presents all the events in a nifty UI that you can scroll through. Events in different countries are separated as columns. But the most interesting part is that only a snippet of the entire timeline is visible; to appreciate it, you roll through it, literally watching the events unfurl. Click on any one of them, and you get a detailed view of what happened. Each one is color coded by event type, whether that’s a full-on regime change, a political move, a protest, or an international response. The brilliance of this UI is that it immerses you in the actual narrative of the events. Moreover, it allows you to see how all the hundreds of protests affected one another during this remarkable flowering of political consciousness.